Chami, F. A. 1999. "The Early Iron Age on Mafia island and its relationship with the mainland." Azania Vol. XXXIV 1999, pp. 1-10. Chami, Felix A. 2002. "The Graeco-Romans and Paanchea/Azania: sailing in the Erythraean Sea." From: Red Sea Trade and Travel. The British Museum. Organised by The Society for Arabian Studies. Dihle, A. 1965. Umstrittene Daten - Untersuchungen zum Auftreten der Griechen am Roten Meer, Wissenschaftliche Abhandlungen der Arbeitsgemeinschaft Für Forschung des Landes Nordrhein-Westfalen. Köln und Opladen: Westdeutscher Verlag. Miller, J. Innes. 1969. The Spice Trade of The Roman Empire: 29 B.C. to A.D. 641. Oxford University Press. Special edition for Sandpiper Books. 1998. ISBN 0-19-814264-1. Fussman, G. 1991. "Le Periple et l'histoire politique del'Inde". Journal Asiatique 279 (1991):31-38. Robin, C. 1991. "L'Arabie du sud et la date du Périple de la mer érythrée". Journal Asiatique 279:1-30. Schoff, Wilfred Harvey, translator and Secretary of the Commercial Museum of Philadelphia, with a foreword by W. P. Wilson, Sc. Director, The Philadelphia Museums. 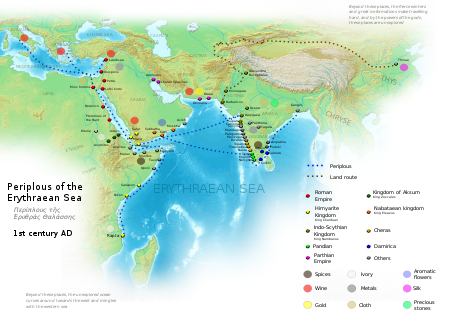 Periplus of the Erythraean Sea: Travel and Trade in the Indian Ocean by a Merchant of the First Century, Translated from the Greek and Annotated. (First published 1912, New York, New York: Longmans, Green, and Co.) Reprinted 1995, New Delhi: Munshiram Monoharlal Publishers, ISBN 81-215-0699-9 . "The present text has been digitalized from the translation of William H. Schoff, The Periplus of the Erythraean Sea: Travel and Trade in the Indian Ocean by a Merchant of the First Century (New York: Longmans, Green, and Co., 1912). Some additional commentary including alternate spellings or translations from Lionel Casson's more recent edition are given in square brackets." Ancient history sourcebook: The basic text from Schoff's 1912 translation. หน้านี้แก้ไขล่าสุดเมื่อวันที่ 1 กุมภาพันธ์ 2558 เวลา 02:55 น.